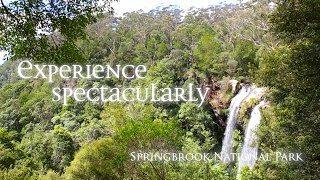 The Springbrook National Park comprises 15,310 acres situated on the McPherson Range near Springbrook and forms part of the UNESCO World Heritage listed Gondwana Rainforests of Australia. Allow 40 minutes for the one and a half kilometre Natural Bridge Circuit, through lush ancient Gondwana rainforest lined in buttress roots, strangler figs, epiphytic ferns and berry covered lily pillies (in Spring). The monumental rock arch formation known as Natural Bridge is very popular with walkers and bird lovers during the day who flock to see the streaming waterfall. At night however the cave comes alive with thousands of nocturnal glow-worms and microbats, which can be witnessed on a guided spotlight tour. A sealed circuit track takes you through the forest, across Cave Creek and into the arched cave to witness the waterfall plunging from above. At night the cave is illuminated by thousands of glow-worms' tiny green lights. While glow-worms are visible year-round, their display is significantly reduced during the winter months. Interpretive signs along the circuit highlight the park's special features. The hoop pines (Araucaria cunninghamii) that emerge through the thick greenery of the surrounding rainforest are living relics of the Jurassic Age-the age of the conifers-about 180 million years ago. These pines are 'living dinosaurs', they are among the most primitive of conifers. Please Note: The Natural Bridge Circuit is managed by the Queensland Parks and Wildlife Service. This map only shows an indicative start point for the walk. The track route and end point are not shown and this map cannot be used for navigation purposes. Please see the Queensland National Parks, Sport and Racing website for detailed maps and the latest park information, including opening hours and safety messages. When you are in the park, make sure you refer to signs at the start of the track for more information.